NEW YORK — The best player in the building was Shamorie Ponds — by far. Ponds scored 20 of his 26 points in the first half, dominating a highly anticipated matchup between two of the nation’s top guards, and St. John’s rebounded impressively from its first loss this season by routing No. 16 Marquette 89-69 on Tuesday night. 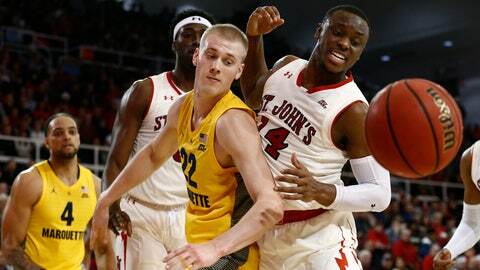 Marvin Clark II had 22 points and Mustapha Heron added 16 — all after halftime — for the Red Storm (13-1, 1-1 Big East), who snapped Marquette’s eight-game winning streak with an eye-opening performance on campus at Carnesecca Arena. With leading scorer Markus Howard held to eight points on 2-for-15 shooting, the Golden Eagles (11-3, 0-1) got blown out in their conference opener. Howard entered averaging 25.1 points per game, best in the Big East and ranked fifth in the country. Joey Hauser had 15 points to lead Marquette, which went 6 of 21 from 3-point range (28.6 percent). The matchup between Howard and Ponds was no contest from the start. Ponds came out sizzling and scored eight points in the first 2:37, matching his total on 2-for-13 shooting in Saturday night’s excruciating loss at Seton Hall. The 6-foot-1 junior from Brooklyn, the Big East preseason player of the year, then scored the final nine points of the first half for the Red Storm, including a long 3-pointer that gave them a 39-31 lead the break. Meanwhile, the 5-foot-11 Howard went 1 for 10 in the first half and never got going in the second. He was whistled for four fouls in 26 minutes. Marquette: Picked second in the Big East preseason poll, the Golden Eagles have quality non-conference wins over Louisville, Kansas State, Wisconsin and Buffalo that moved them up the national rankings. But away from home, they’ve lost by wide margins to Indiana, Kansas and now St. John’s. “There’s no question we have to show much better toughness and execution on the road,” Wojciechowski said. St. John’s: Picked fourth in the Big East preseason poll, the Red Storm are targeting their first NCAA Tournament appearance in four seasons under Mullin. They opened 12-0 against non-conference opponents for the school’s best start since winning its first 14 games in 1982-83, Mullin’s sophomore year. The run ended at Seton Hall in the league opener — but dating back to last season, St. John’s has won its past three regular-season games against ranked opponents. “Whoever we play, we feel we have a good enough team to beat anybody,” Mullin said. St. John’s led by 10 with 6:20 left at Seton Hall and had several chances to close it out, but got stagnant on offense and lost 76-74 on a 3-pointer by Shavar Reynolds with less than a second remaining. Marquette had a 27-2 edge in points off the bench. … St. John’s had a 12-0 advantage in fast-break points and shot 54 percent from the field, including 11 for 24 (46 percent) from beyond the arc. Backup forward Sedee Keita, who had been out since Nov. 9 with an injury, came off the bench for St. John’s and contributed two blocked shots in nine minutes. Marquette: Will host Xavier on Sunday in the Golden Eagles’ first Big East home game this season. St. John’s: At old rival Georgetown on Saturday, when Mullin squares off against Hoyas coach Patrick Ewing once again in a story line that dates back to their Big East and NBA playing days. St. John’s has lost 13 in a row at Georgetown since a victory on Jan. 18, 2003.